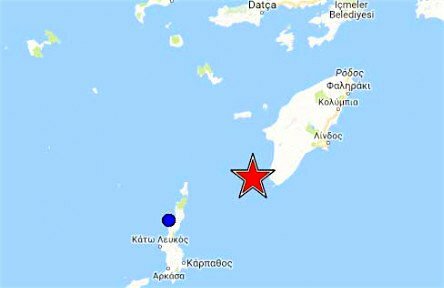 An earthquake measuring 4.1 on the Richter scale shook Rhodes and other islands in its vicinity about 2:30 on Wednesday afternoon. The epicenter of the earthquake was located under the sea between Rhodes and Karpathos and about 33 km south of the island of Halki.“The earthquake had a focal depth of eight kilometers and its epicenter was very close to the southern tip of Rhodes,” said Professor Efthymios Lekkas of the Greek Organization for Anti-Seismic Planning and Protection (OASP). According to reports received by OASP, he added, the tremor has not caused damage to buildings on the island.